I've recently been trying out some products from Bumble and Bumble and I can officially say that I am now a fully converted fan! I've seen Bumble and Bumble products raved about all over the blogosphere and on YouTube and they really are as good as people say and definitely worth the money. I've already shared with you my thoughts on the Thickening Hairspray (read review here) which is now my holy grail product for volume, as well as the Seaweed Mild Marine Shampoo (read review here) which I have been loving and will be picking up the matching conditioner for shortly! Today I am going to share my thoughts with you on their Creme De Coco Masque and the Curl Conscious Reactivating Mist! 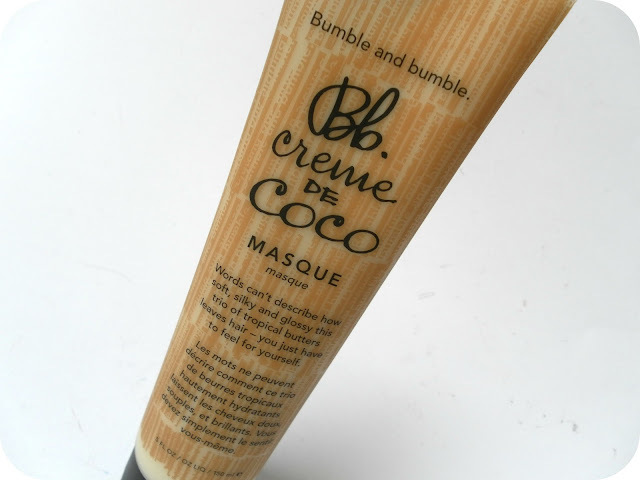 The Creme De Coco Masque comes in a gorgeously designed 150ml tube and leaves your hair soft, silky and glossy. It has a trio of tropical butters and is to be used once a week after shampooing. Simply put a generous amount on to your hair and leave on for a minimum of 5 minutes, then rinse thoroughly. Now, conditioning treatments and hair masques are a regular in my hair routine. I like to do whatever I can to look after my hair and masques and treatments are a great way to keep your hair in perfect tip-top condition. This masque, oh golly gosh, it smells absolutely divine. The strongest scent which pulls through is coconut, then shea butter. Both are well known ingredients for their conditioning and smoothing properties. I have been using this once a week and it is quite a thick masque, but a little goes a long way. It leaves my hair feeling amazing soft and very healthy looking. This is a proper treat for my hair and I will definitely be picking up another tube when it runs out. I also want to try the Deeep masque! This amazingly scented masque costs £21.50. Naturally, my hair is very curly. When I was younger these curls used to be much more defined and I never really had to do anything to them. But as I have gotten older and use heat styling products on my hair on a daily basis; such as hair dryers and straighteners, my curls have become more wavy and much, much more frizzy. I like wearing my hair naturally curly but when they just look messy they really lose their appeal to me which is why I straighten my hair most days. 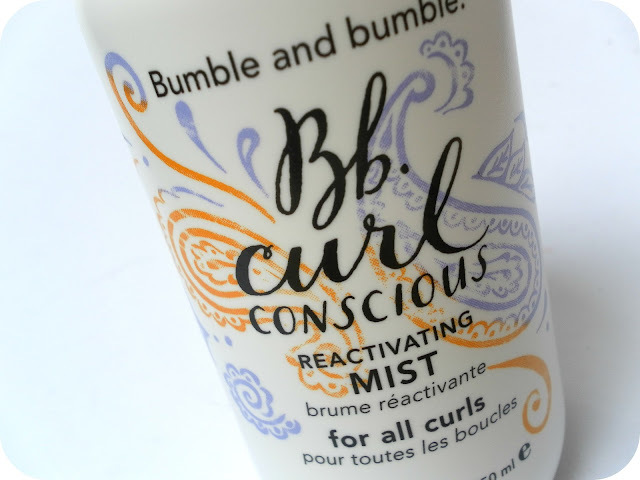 The Curl Conscious Reactivating Mist is suitable for all curls. In a beautifully decorated bottle and has a distinct smell - but I can't pin point what off? It's not offensive anyway and it's quite a pleasant smell. You can use this mist any time throughout the day to tidy and refresh curls and it should be the last product in your styling routine. It works to reawaken soft waves or tame hyperactive curls with curl enhancing transglutaminase. I also really like spraying this through my hair when damp and on it's way to drying if I don't plan to straighten my hair that day. I find it works well to tame my curls before they fully dry as well as being a lovely refreshing spray for throughout the day. It's a nice change from mousses and balms marketed for curls; as it's a spray it doesn't leave my hair feeling heavy or packed full of product. And the pleasant scent (that I will work out one day) sticks around too, so it leaves my hair smelling lovely! I'm pleasantly surprised and impressed by this product and it's making me leave my hair curly more often! The Curl Conscious Reactivating Mist comes in a 250ml bottle and costs £19.50. iI have this masque and it`s simply amazing!